Gates' Belmont Partners investment firm just dropped $80 million to jump start development of a 'smart' community in Arizona. What's the country's wealthiest man to do with an extra $80 million lying around? Build his own "smart city," of course. Microsoft Corp. (MSFT - Get Report) cofounder Bill Gates and his investment firm Belmont Partners have invested $80 million to jump-start development of a smart community in Arizona. Gates bought about 25,000 acres of land in the state's West Valley, about 45 minutes west of downtown Phoenix, Belmont Partners told local media, according to KPNX. The proposed community will be called Belmont. "Belmont will create a forward-thinking community with a communication and infrastructure spine that embraces cutting-edge technology, designed around high-speed digital networks, data centers, new manufacturing technologies and distribution models, autonomous vehicles and autonomous logistics hubs," Belmont Partners said in a news release. Gates bought about 25,000 acres of land in the state's West Valley, about 45 minutes west of downtown Phoenix. Belmont Partners said 3,800 acres will be devoted to office, commercial and retail space. About 470 acres will be used for public schools, and most of the rest of the land will be used for as many as 80,000 residential units. It's not yet clear when construction will begin. 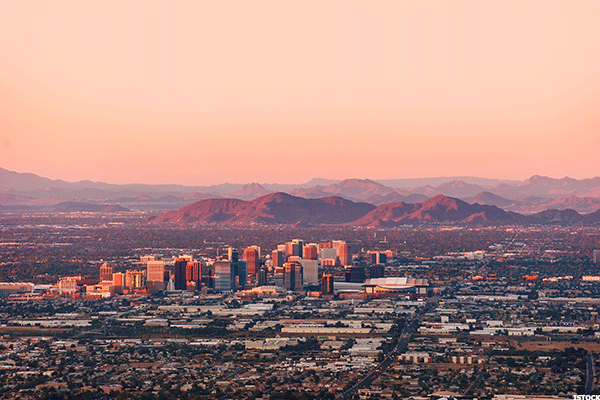 "Comparable in square miles and projected population to Tempe, Arizona, Belmont will transform a raw, blank slate into a purpose-built edge city built around a flexible infrastructure model," Belmont Partners said. Gates' venture into utopian community development will work to best similar attempts around the world. Nearby in Arcosanti, Arizona, architect Paolo Soleri created an experimental town in the 1970s aimed at integrating architecture and ecology. In India, the federal government is working to build 100 high-tech cities to serve as idealistic layouts for the country's future infrastructure. The bid to create the smart cities began in 2014, but has drawn criticism from India's private sector for taking too long to get off the ground. As for domestic smart city development, the ball is now in Facebook (FB - Get Report) billionaire Mark Zuckerberg's court to match this purchase. The owners of Louis Vuitton and Gucci pledge more than €300 million to rebuild Notre Dame Cathedral, while energy company Total and other big businesses also say they will donate millions. What Is the Capital Gains Tax on Real Estate in 2019? When you sell real estate you've held as an investment, the rate at which you're taxed on the profit from it may vary. Home sales, being a specific type of capital gains, have their own set of rules.